This paper describes and analyzes the development, purposes, and content of provincial early learning curriculum frameworks and highlights the tools for practice they offer. Attention is given to particular theoretical perspectives articulated in the frameworks, and to examining how the frameworks address the critical issue of diversity within provincial contexts. An account of the implementation and evaluation of the curriculum frameworks in early childhood settings within each province is provided. Finally, there is a discussion of what is needed to sustain the use of the frameworks by early childhood educators. This Occasional Paper No. 24 is available from the Childcare Resource and Research Unit in an on-line format only. 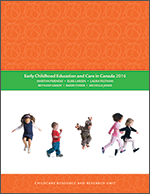 It is a working version of a chapter prepared for New Directions in Early Childhood Education and Care in Canada (working title) edited by Nina Howe and Larry Prochner. Expected publication date 2011 (University of Toronto Press). Limited availability. Please แจก user ทดลอง เล่น ฟรี ถอนได้contact us for more information.